News, Performances | September 26, 2018 | by Missy Pfohl Smith. BIODANCE, fivebyfive and video artist Josh Thorson receive month-long artist residency at Visual Studies Workshop! As a tribute to composer, vocalist, dancer, choreographer and filmmaker Meredith Monk, the quintet fivebyfive will pair up with artist Josh Thorson and choreographer Missy Pfohl Smith/BIODANCE to explore Monk’s music visually through movement and video. This collaboration will explore three mediums in which Monk herself actively works: music, film and choreography/dance. 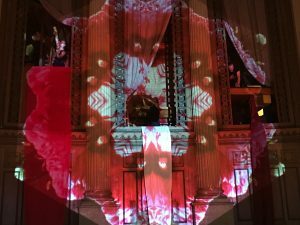 The project will combine music arranged for fivebyfive by the quintet’s bassist Eric Polenik, with visuals and movement that will be developed over the four-week residency, Nov. 5 – Dec. 8, 2018. The residency will culminate in a performance on December 7, 2018, and the group return to the collaborative work in future performances. Uncategorized | September 1, 2018 | by Missy Pfohl Smith. Rochester, NY – Lush contemporary dance, opera, and media projection and live music create a new way of seeing the majestic Lyric Theater. 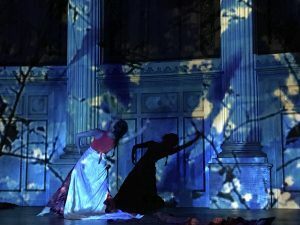 This all-new panoply directed by Missy Pfohl Smith (Artistic Director, BIODANCE and Director, Institute for the Performing and Arts and the Program of Dance and Movement, University of Rochester), will surprise audiences with eye-popping visuals that shed new light on opera, history, and performance. 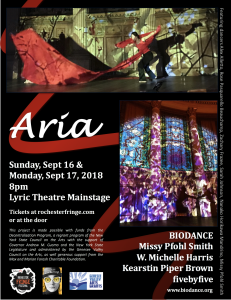 From the co-creators of the sold-out shows Anomaly and Labyrinth at the Strasenburgh Planetarium, Aria will be performed by BIODANCE and media projection artist W. Michelle Harris (Associate Professor, RIT), with one of Rochester’s favorite chamber ensemble fivebyfive, and the magnificent soprano Kearstin Piper Brown! 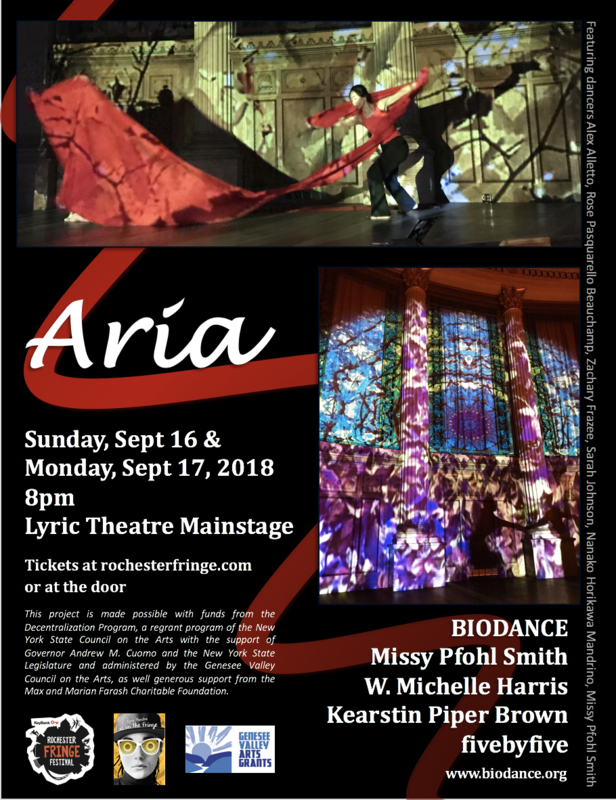 “BIODANCE is excited, once again, to enter brand new territory, playing in a gorgeous space, the Lyric Theatre, one of Rochester’s architectural gems, in collaboration with long-time media artist partner W. Michelle Harris. We will collaborate for the first time with world renowned soprano Kearstin Piper Brown and with fivebyfive, a sublime modern chamber ensemble whose arrangements for flute, clarinet, piano, bass and electric guitar are stunning” says Missy Pfohl Smith, project director and choreographer. Dancers include Rose Pasquarello Beauchamp, Zachary Frazee, Sarah Johnson, Nanako Horikawa Mandrino, Jean Michael Rubingu, Missy Pfohl Smith. Proud to be part of Keybank Rochester Fringe Festival for the 7th year, BIODANCE has delighted audiences and sold out Fringe shows at the Strasenburgh Planetarium and Geva Theatre Center’s Fielding Stage, and even performed for an estimated 13,000 audience members as part of Friday on the Fringe on top of the 177 foot “Tribute to Man” sculpture at Martin Luther King Jr. Park in collaboration with Grounded Aerial. BIODANCE is thrilled to be back with this all-new multi-disciplinary show. fivebyfivebegan as a project idea in 2015 to perform music by Brooklyn, NY based composer Missy Mazzoli. The flutist of the group, Laura Lentz, heard Mazzoli’s ensemble Victoire at the Detroit Institute of the Arts back in 2014 and fell in love with her music. fivebyfive evolved into the present quintet of Laura Lentz (flute), Marcy Bacon (clarinet), Sungmin Shin (electric guitar), Eric Polenik (bass) and Haeyeun Jeun (piano), and is based in Rochester, NY with an active performance and teaching schedule. Missy Mazzoli’s work Magic with Everyday Objectsfor fivebyfive’s instrumentation still remains one of the ensemble’s favorite pieces to perform. fivebyfive’s mission is to engage audiences in the collaborative spirit and creativity of modern chamber music by commissioning, arranging and performing a wide range of works for its instrumentation. Forging a variety of community partnerships and presenting interactive educational programs, fivebyfive brings music born out of today’s culture to concert halls and classrooms. In 2017 the ensemble became a 501(c)3 not-for-profit organization. The quintet has received funding from New Music USA, The Farash Foundation and the Decentralization Grant of New York State for its programs, and actively collaborates with artists across a variety of disciplines, including poets, dancers, visual artists and musicians across the genres.